This Roe L27/28R Bristol K5G was delivered to Keighley – West Yorkshire (as K383) in April 1950. Over sixty-one years later KDG26 is seen passing through the impressive arch of the Halifax Piece Hall when taking a very active part in the Heart of the Pennines Event in October 2011. Chassis number 47.023, body number GO3063. CWX 671 was in fact new in 1938 and rebodied by Roe in 1950. This epic picture of what is still, today, a magnificent vehicle and in fine condition and brings back happy memories for me from the days in the early 1960s when I was a young conductor at WY’s Ilkley depot. At that time the staff position at Keighley was critical and we were often sent there to help out, on completely unfamiliar routes of course. On one occasion I was sent on route 19 to Hebden Bridge and, my word, what a wild and desolate, but beautiful nevertheless, route it is. In fact so desolate that some of the fare stages could only be described by "fourth milestone from Hebden Bridge" etc. and one of the stages mentions "Galstones" !! One of my most treasured possessions is my 1960 fare book which I often dip into with great pleasure. Regarding the 19 route I still shudder even now in the car at how they went on in the icy Winters – there is a "Swiss style" treacherous hill near to Hebden Bridge with minimal edge protection and a wicked sheer drop in the event of a mishap. A route not for the faint hearted and that’s for sure. An unusual view, Les, and thanks for posting. For a more ‘traditional’ angle of viewing this specimen, please refer to my own posting of her in Fleetwood. Keighley – West Yorkshire was established as a branch of West Yorkshire Road Car in 1930, if we believe the entry on Wikipedia. CWX 671 was new to KWY in 1938 and is a Bristol K5G, but the bodywork is not what one might expect, being by Roe rather than by ECW, and is to L27/28R layout being rebodied in 1950, it originally did have an ECW L27/26R body. We see her in North Albert Street, on the corner of Kent Street, Fleetwood, arriving to take her place for Tram Sunday on 20 July 2003. It was actually 1932 when Keighley Corporation "gave way" into Keighley West Yorkshire Services Ltd. Also, after the April 1954 renumbering, these DGs never had the fleet number on the front dash as shown here. Before the April 1954 renumbering, they DID carry fleet numbers here. 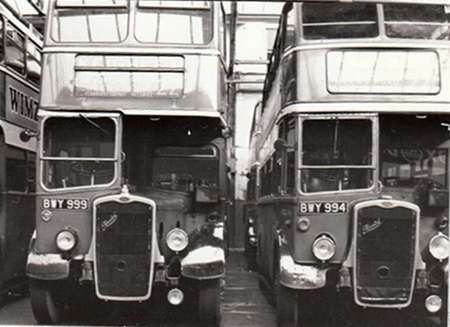 These Roe bodies were of exceptional quality and were ordered because ECW were unable to carry out the total rebody requirement for the K class pre war buses. It was part of a wider "ex Tilling Group" exercise with United Automobile also being involved. Wonderful old Bristol buses, and firm favourites of mine as we were blessed with a good allocation at Bradford depot! Thanks Pete for a super memory jogger! Thanks, John. I wasn’t aware of her original body details, and I suspect that Peter added this bit from his sources. Exceptionally good-looking body, the more so because it’s a low-bridged one, yet don’t obviously look it. The blind display itself is very informative, if not presented well in the photo! Thank goodness the re-build also included the lower PV radiator, otherwise the overall effect would have been greatly diminished!. As John points out, ECW at the time were at full stretch, with full order books and a backlog developing, hence the rebodying of sixteen of West Yorkshire’s Bristol K5G ‘rehab’ chassis by Roe in 1950. The vehicles concerned were Keighley-West Yorkshire K362/366 (BWY994/998) dating from 1937, and K381-384 (CWX669-672) from 1938. Main fleet vehicles so treated were 385-394 (CWX673-682) from 1939. In the 1954 renumbering K362/366 became KDG16/20, K381-384 became KDG24-27, and 385-394 became DG28-35. When delivered, they were unusual in having the beading edging the cream bands picked out in red, rather than the usual black, and I believe all sixteen retained this feature throughout their WY/KWY lives. A lovely shot of KDG26, and to my eyes bright sunshine always seemed to show the Tilling red at its best. Wonderful. 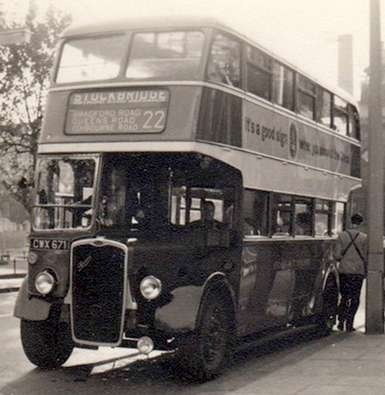 KDG26 was part of a batch of 16 buses supplied with Roe low-bridge bodies in 1950. 10 were owned by the West Yorkshire Road Car Company Ltd and 6 including KDG26 were owned by Keighley-West Yorkshire Services Ltd. My records for 1953 show all the 10 WYRCC buses were allocated to the Bradford depot and this confirms the comments from John W. They were lovely solid buses to ride on and sometimes appeared on the Bradford to Ilkley 63 service which was my home route. I do recall United Automobile having some similar Bristol K5G/Roe re-bodies but I am not sure of the number they had. Can anybody supply more information? More shots of KDG 26 taken at a Gardner Engine Rally held in June 2005 at Castlefield Canal Basin in Manchester. As well as buses the event included lorries, narrowboats and static engines. Anything was welcome as long it had a Gardner engine. It was a very successful event but I am not aware that it was ever repeated although I moved away from the north west shortly after and lost touch with events in that area. The fascinating thing about these Roe rebodied K5Gs is the body profile, which seemed to have more in common with the pre-war ECW bodies carried originally, than the contemporary ECW design! The chassis overhaul was very thorough, including of course, the update to PV2 radiator. I doubt that the original bodies were worn out either, as 5 were transferred to 707-711, the W sanction K6As originally with Strachan utility bodies, later to be K5Gs. Probably the whole exercise was the result of a calculation to maximise the life expectancy, an aim which was well fulfilled! To cover this K rebodying programme, the G type buses mainly remained in service until 1951/2, and what memories they bring back! PS. !! Just to echo Brendan`s comment about Tilling red! It was a classic livery . If only the modern image was so adorned !! Thank you for your thoughts, gents. Coincidentally First Leeds have just repainted a Volvo/Gemini double decker into WYRCC Tilling red with single cream band livery (or an approximation of it). Interesting thought, John. It has to be better than the multiple shades of grey "camouflage" paint job. BGL 17-18,20-21, later BDO 17,18,20 & 21. New in 1939 with ECW 5684/5/7/8 L24/24R series 1 bodies, Rebodied in 1950 as LUT 1-4. EHN 619 was not rebodied. It’s probably not a coincidence that First Leeds have painted a Volvo in Tilling Red since one of the current owners of CWX 671 is a very senior member of management at First Bus. I’ve just been lent some Omnibus Society Magazines dating from 1963 and there was some comment about the fact that this bus had been entered in the London – Brighton run and some people felt it was too modern. I bet nobody would complain if it was entered now. Having seen it at the Sheffield running day last weekend, I don’t think the first bus Gemini is the correct shade of red. Many thanks Ron M for the detailed information on the United Bristol K5Gs. It’s a while since a topic has come up on which I can comment. Here are three photographs which I took of Keighley West Yorkshire K5Gs in 1961 and 1963. 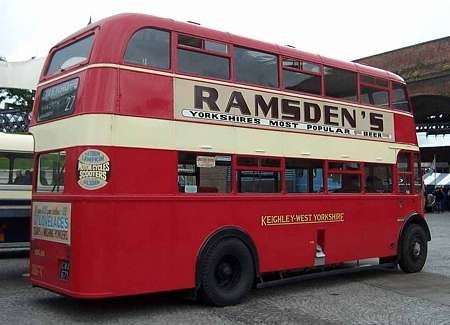 I grew up in Keighley and used these K5Gs every day because they were the mainstay of the cross town routes. In this photo of BWY 999 (KDG21) with BWY 994 (KDG16) you can see the difference in them as they are parked side by side in Keighley depot, the ECW body on the left and the Roe on the right. In this photo showing the entrance to Keighley garage, the ECW bodied CWX 668 (KDG223) is next to the famous CWX 671 (KDG26). This shot was taken in October 1961 on a Sunday morning. The buses are watering up ready for going into service. It’s a pity that we can’t see the fleet number on KDG 26, and that is because it was one of the handful which retained stamped metal number plates. I am not sure of the dates when these plates were fitted to the buses, but they were not very legible and so were replaced by transfers. The third photo shows KDG26 just 3 months before it was withdrawn and it looks smart even then. The photo was taken 30/9/62. oooH! Nice, David, and very atmospheric! Thank you for posting. Lovely photos David and thank you for posting. The aluminium fleetnumber plates you mention were introduced in summer 1957. They were applied externally to 52 vehicles, but by the end of the year the idea had been dropped – the plates being difficult to read at a distance, as David points out. West Yorkshire had had two plates produced for every vehicle in the fleet, and it was decided that they would be fitted internally to each vehicle instead, rather than scrapping them altogether. (One was fitted in the cab and the other near the entrance door). Was Ramsden’s "Yorkshire’s Most Popular Beer"? Ramsden’s brewery occupied the site in Halifax currently occupied by the HBoS offices. Tetley’s brewery, of Leeds, purchased Ramsden’s in 1964, the brewery was demolished in 1968 . . . the then Halifax Building Society’s head office rising from the site in 1973. 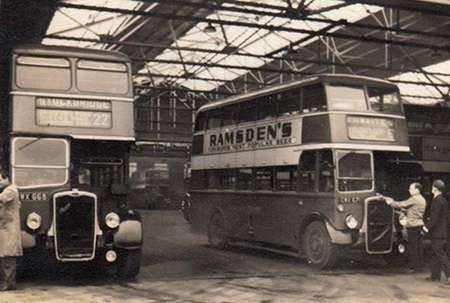 History suggests perhaps that Ramsden’s might have been over-stating their popularity! Advertisements on buses provide a window into other aspects of social history, which I’m starting to appreciate more as I accelerate past middle age. A while back I posted a gallery of photos taken on the occasion of a Farewell to Samuel Ledgard tour in 1967. 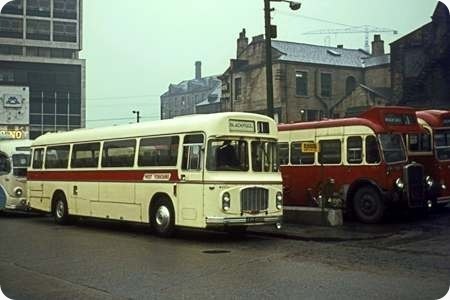 Taken on the same day at the start of the tour is this one showing West Yorkshire Road Car’s fine Bristol RELH6G/ECW coach ERG5 (AWR 405B)loading in Bradford’s Chester Street Bus Station. Behind is our tour coach – Ledgard’s Tiger Cub/Burlingham Seagull UUA 794. 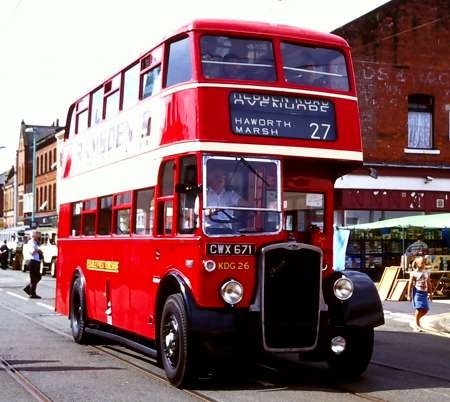 Alongside is West Yorkshire’s SBW28 (KWU 388), a Bristol LWL6B/ECW B39R new in 1952 as no. 451 but renumbered in 1954. It was withdrawn in November 1967 and sold to North’s the dealer in 1968, passing to Drury (Northern) Ltd, Huddersfield for works transport. Behind the LWL is SMG11 (MWR 222), a Bristol LS5G/ECW B45F new in 1954 as EUG11 with DP41F seating. It had been rebuilt by ECW as B45F in 1958 and renumbered SUG11, but then renumbered again to SMG11 (in the MW series) in 1962. It was withdrawn in 1968 and also sold to North’s. My first solo visit to London from Sheffield was on one of these. (E reg. – but I didn’t record which one.) I knew I would not get a ZF Reliance – SUT didn’t do Yorkshire Services and East Midland didn’t do the Sheffield diagram. The ZF Reliance remains my favourite but the RE was a revelation and started my "love affair" with the marque and model both as passenger and as driver. A magic carpet ride and smoothly quiet. Was this only the ’60s? [Stephen Morris once said that standards of ride and engineering were never bettered than on the AEC Regal IV – the same could be said, especially of rear engined vehicles, of the Bristol RELH6G/L (and sisters)]. In Lancaster, we used to have West Yorkshire vehicles coming through on the X88, which ran between Morecambe and Leeds/Bradford. So far as I can recall, these were usually from the CUG/EUG/SUG classes of LS, but we had the more modern MW types from time to time. I have a view of one of these in the background of a slide of one of the Standerwick Atlanteans, but it isn’t suitable for publication. With the others, there were obvious differences, but why was the example above not a full CRG??? Probably due the peculiarity of official designations by BTC/ECW for these early coaches, Pete. If they had full destination blinds (including number boxes) and powered folding doors, then they were designated DP (express). If they had a single piece coach door and small destination blinds without number box they were designated Coaches. DPs included United’s 43 seaters fitted out to the most luxurious specification for the long trek to London. [Including the arm-chair like seats, a notable feature of RE coaches.] This looks like one of these United-like "DPs" – although 47 was the usual capacity for these REs. PS: The new Weymann Part 2 book designates Sheffield’s Fanfare Leopards as Express. The only difference between them and any other Fanfare produced is the full destination display – including number box. I agree with David Oldfield’s comments regarding the quiet comfortable ride of the ECW bodied RELH6G I think because the bodywork was so solidly built with good sound insulation and as they normally had only 47 seats quite spacious for passengers. Driving on the other hand especially on the early 5 speed manuals took some getting used to as hearing the engine note to time gear changes was not easy but once mastered it gave genuine satisfaction, the main bugbear was what seemed to be too wide a gap between the 2nd and 3rd gears which was present on all RE’s coach or bus that I drove. Also be careful selecting reverse on those type if the heater control was in the mid position in it’s quadrant as it was very easy to trap your finger very painful, but for all that I am glad to have driven the vehicles of the 60’s and 70’s rather than the automatic power operated point and steer vehicles that have followed since then where I would feel more of a wheel hand than a driver. Yes. As an operator friend of mine once said, "I want professional drivers, not steering wheel attendants." As a fan of the ZF manual box [I know, not available on REs] I have only ever driven semi-automatic REs. Pleasurable, nonetheless. The gap between ratios on 2nd and 3rd gears was always far more noticeable on the Leyland Leopard, though. I have always been a fan of the RE despite an unfortunate incident involving one. In 1973 I went from Salisbury to Swindon for the purposes of a vasectomy. The deed was done and I caught the service bus home. 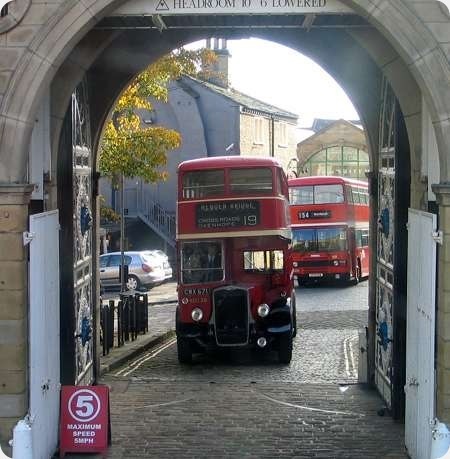 At the time this route was shared by Wilts and Dorset and Bristol Omnibus and it was the latter’s RE that I boarded. Despite a dose of aspirin and decent suspension I felt every bump! At the short stop in Marlborough I had a walk round but was very glad to reach Endless Street bus station, which incidentally the asset strippers are going to sell now. Several years ago I saw a preserved example at the Warminster running day. It pulled away with that glorious Leyland sound and distinctive transmission noise and a shudder went through me. A lovely shot John, crammed full of interest – and doesn’t that cream and red livery really brighten up the wet weather scene? I cannot help but agree with David and Diesel Dave’s comments regarding the RE coaches. I had a real soft spot for them and thought they looked elegant and restrained, and as you say David, gave a very quiet and comfortable ride. West Yorkshire provided a coach for interested Central Works and Harrogate depot staff to visit the 1970 Earl’s Court Commercial Show. The company provided ERG7, their only ERG with semi-automatic transmission. It was such a smooth and gently powerful beast, and our three drivers (fitters Johnny Berry and Malcolm Houseman, and I think, driving instructor Johnny Parker) drove it as taught. Each upward gearchange was paused in neutral, to allow the Gardner engine’s revs to ‘die down’ before the next ratio was selected, and the changes were barely perceptible. Only the engine and exhaust notes gave the game away that the next gear had been selected. 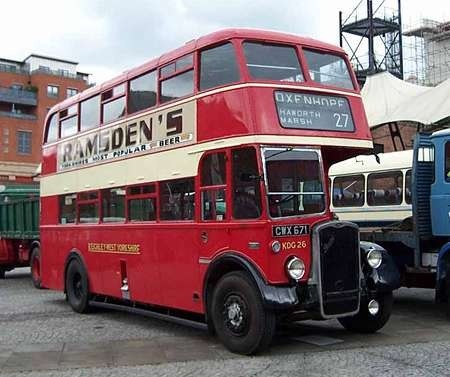 David’s comments are correct relating to the designations – ERG being Express, Rear engine, Gardner, as the class had bus-type glider doors and a bus-style destination layout. They were painted cream and red, denoting their ‘dual-purpose’ status. The full coach version (CRG) had a one-piece coach door, and had a smaller coach-style (two aperture) destination display. Livery was cream and maroon, as befitting their more prestigious duties, and the coach version also sported a deeper aluminium trim strip beneath the side and rear windows, which was also ribbed. By the way David, if the coach you rode on to London was E-reg’d, it would have been CRG1 (OWT 241E), as it was WY’s only E-reg’d RELH. It was always my favourite WY RELH, and was company’s only manual gearbox CRG. It also had a fascinating history all of its own! Brendan, thanks for that. Would that mean it was the RELH6B that was an "unfinished" test bed vehicle built sometime before 1967? After fulfilling its test duties it was re-engined with a Gardner and sent to ECW to be properly finished. Just like Brendan I have the very greatest admiration for all versions of the Bristol RE. Having at one time had many relations in the South I was a fairly regular traveller on the London services and the RE coaches were above reproach in all respects, particularly quiet smooth running and supreme comfort – we have every sympathy with your predicament Paragon but the Bristol can scarcely be blamed for that, and what a mercy you didn’t have to travel home on some of today’s ghastly apologies. The Bristol RE service bus was equally impeccable in every way – not least in tidy professional ECW appearance. A well known driver who at one time used to write very balanced, sensible and informed articles about various models once gave the RE a wicked slating, saying that its road holding was nothing short of dangerous etc etc – I was amazed by this obviously genuinely meant opinion, and could only reflect on what he might have thought to a wet road and an AEC Swift with most of the load in the rear area !! 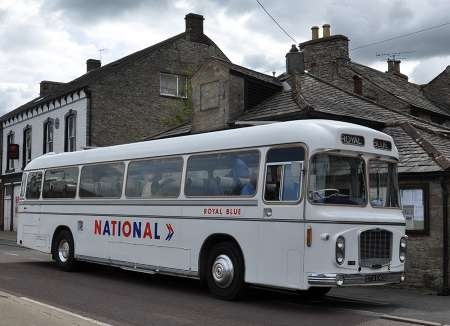 …..or a Leyland National 1….. I once caught the by then National Express coach from Wigan to Leeds in the mid seventies I was somewhat surprised when an ECW bodied RE West Yorkshire coach arrived. The ensuing ride was a bit of a Tardis moment; a superb ride in a seat that todays body builders would do well to study. A well driven bus complete with conductor of vintage years. Incidentally did ECW ever change the seat support design (on the aisle end) in the last 40 years prior to their final closure? All the ones I’ve ever seen look like they were designed in the thirties. Oh yes, Chris, those were the days….. Yes David, CRG1 was indeed the Bristol RELH6B test bed vehicle you describe (chassis number REX003). It did have a turbocharged Bristol BHW engine fitted at one point while with Bristol C. V, which was based on a horizontal version of the BVW unit. As you say, it was later fitted with a Gardner 6HLX engine, and the body kitted out to full coach specification. The BHW engine never went into production, which was a pity in some ways, as the sound effects would no doubt have been quite interesting, whether in turbocharged or naturally-aspirated form. —- sorry but I think these vehicles looked really good in the NATIONAL livery and I’m glad that OTA 640G is carrying this livery in preservation. It looks sleek and stylish, but I know such a comment might upset people who always want to see vehicles in original liveries, but here again there are already a number of Bristol RE coaches preserved in Royal Blue livery. Ken. You could be right, but a Duple or Plaxton looks horrendous. The ECW gets away with it because of its parallel straight line. My point is not so much that they didn’t look nice, some types suited the livery very well, but it was the fact that they all looked the same. Pre NBC the BET group used a wide variety of vehicles with many instantly recognisable liveries, but even the more uniform Tilling fleets still had a certain amount of individuality, Royal Blue and United being classic examples. However, when they became NBC they lost all that and became anonymous and boring. In the mid 1970s I used to travel quite frequently between Purley and Eastbourne by National Express. The vehicle that usually turned up was a National Travel (South East) [aka Timpson] Bedford YRQ carrying a Willowbrook Spacecar body, and the thing always made a meal of the gradients along the Caterham Valley and across the Weald. The standard of ride was truly awful, pitching and bouncing over quite ordinary road surfaces, and the bodywork itself seemed to be exceedingly plastic and crude. At weekends, the outbound trip from Purley was sometimes duplicated by an RE such as that shown in Ken Jones’s photo, and the contrast in high passenger comfort and effortless road performance could not have been greater. Having driven YRQs with bus bodywork, I suspect that much of the problem with the NT(SE) coaches was the Spacecar body, which soon acquired a notorious reputation for fragility. The Bristol RE was an outstanding design, and Stokes couldn’t wait to kill it off in favour of the Leyland National. An RE was the best for the passenger and the driver. It did depend on the suspension type and I drove my first one in the mid 60s for United Counties from Northampton to London. Once on the motorway she could be opened up and the front seemed to rise slightly and she was away. The steering was good and ideal for town work as well. Going through was a doddle. I drove a lot of RE’s for the Royal Blue and they were just as good. They were good for luggage also which helped to distribute the weight. They would not cope with the size of some of the suitcases which are in use these days. The ECW coach body on the RE was a thoughtful blend of traditional and modern design based on excellent engineering and quality standards of build. At the time there were a good number of outstanding looking (and quality) coach bodies available on a Leopard and Reliance chassis and of course BMMO had their own excellent contender, but for pure class in every department nothing beat the RE/ECW combo and it survived to look the least bland in National’s so called livery. Diesel Dave’s comment regarding the difficulty in hearing the engine to time gear changes, reminds me of the many journeys I made between Newcastle and Leeds on these vehicles. Most drivers kept the cab window open to hear the engine/exhaust. One chap though, who I regarded as the absolute expert, used a different technique. On the up changes, the gear lever would be offered very gently to the next position. You could see the stick vibrate but such was the delicacy of touch that no grating sound could be heard. When the revs were right, the vibrating ceased and the lever just fell into the next gear! At the other end of the scale we once had a Northern General driver (I have no idea why) who had never driven an RE before. We crunched and ground our way south with the driver trying to avoid changing gear whenever possible. To his credit, he admitted that the problems were down to him and not the bus. When I started work at Keighley depot there was DX types SMGS SMAS SRGS VRS LHS lots of conductors the real thing always on time very rarely missed not has comfortable I remember KDX 39-44 69-71 93-96 KDX 133-145 162-166 I think KDX 138 was based at Skipton along with VR 44 later to be 1944 SRGS were good to drive with the semi auto-gearbox I went to Lowestoft to bring back the Leyland Olympian I brought 1801 I think it had a Vorth gearbox 2 more of my fellow drivers brought 1802 1803 these were taken to Harrogate then later they came to Keighley also around that time the Leyland National was introduced the DXs and SRGs where disappearing. Well good folks of OBP, I have to apologise most profusely, and especially to our David O, for peddling mis-information on 18.1.13 relating to West Yorkshire’s CRG1. I have only just realised, whilst browsing on OBP that CRG1 was not WY’s only E-regd RELH. For some inexplicable reason I had totally forgotten about CRG2-4 (PWR 858-860E). I could blame this on the ‘short’ E-registration letter year (‘F’ suffix registrations commencing in August 1967, heralding the letter suffix ‘year’ changing from January to August) or I could blame teenage excitement on the arrival of the five dual-door RELL6Gs (SRG34-38:PYG 652-656E) overshadowing all else, but it was neither. I’m now off to eat a large slice of humble pie with a few green beans!